Snotty but undefeated air fives* 5am club! 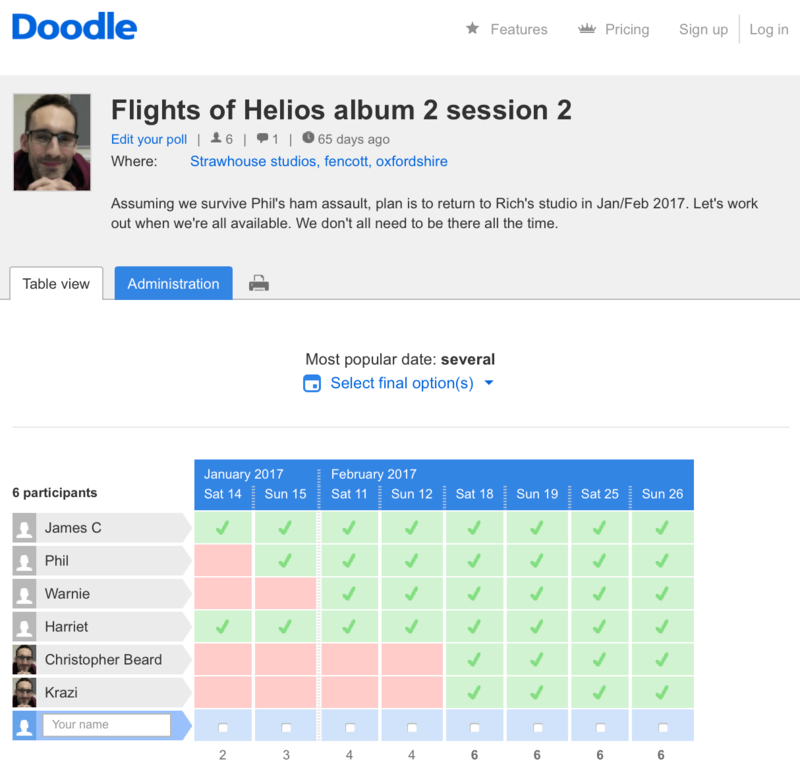 Along with a shared band calendar, Doodle is our top tip for finding out when people are available to do stuff. It’s easy to use and free, the best combo. Essentially you suggest some dates you think might work, everyone responds yes/no to each one and then you get a grid showing what days everyone can make. Create an event, eg. ‘Next recording session’. Select some potential dates. Tip: if you want to make it a whole week or weekend, click the first date then drag the right-hand arrow along. Specify start/end times if you want. Leave it as a ‘Basic’ poll if you just want people to respond yes/no to each date, otherwise there’s a few additional options like yes/no/if need be. Bang in the emails of your bandmates and hit Finish. They’ll then be emailed the suggested dates. Let us know how you get on. See ya tomorrow! This entry was posted in IT Support and tagged admin, diary, doodle, organisation, scheduling, stress reduction. Bookmark the permalink.